The very first chapter book I read aloud to Aaron was The Mouse and the Motorcycle. I had no intention of waiting so long before picking up another book by Beverly Cleary. In fact, several times over the last few months, I've had one or another of her books in my hands, ready to read to the boys. But other books kept creeping in and stealing their places. But finally, Henry Huggins had his turn, and I would be surprised if we wait very long (certainly not a year and a half!) before returning to Klickitat Street. According to Henry Huggins, nothing very interesting ever happens to him. But one day, as he is about to make his way home on the bus, he sees a stray dog. Henry tries (albeit a bit half-heartedly) to make the dog go away, but the dog seems to like Henry (and from the looks of it, the feeling is mutual). With his mother's permission (she's obviously a much braver mother than I am), Henry makes his way home (not without a good deal of trouble) with the newly-christened Ribsy. The two are instantly inseparable, and just having a dog makes life a whole lot more interesting. We liked The Mouse and the Motorcycle, but we loved Henry Huggins. Don't tell, but it might beat out Charlotte's Web as our very favorite readaloud. Aaron and Maxwell were enthralled. For the first time ever, they forgot to look for the pictures because they were so completely wrapped up in the story. I could never read enough for them; they always wanted more. It's very possible we could have read the entire thing in one sitting if we'd had three hours to kill. The chapters were long, but they didn't seem to notice--probably because they were about trying to smuggle a dog onto a bus or hundreds of goldfish or fat, slimy night crawlers. Although I'm sure girls would like it too, this book was clearly intended and written for boys. And that fact alone instantly endeared it to me. I think I can best sum up our feelings by just talking about our favorite chapter: "Henry and the Night Crawlers." In this episode, Henry and his friend, Scooter, are playing catch with Scooter's new football. It is just the kind of football Henry has been longing for: genuine cowhide stitched with nylon thread and laced with buckskin thongs. Quite by accident, as they are tossing the football back and forth across the street, a car zooms past, and the football sails from Henry's hands and through the open window of the backseat. Scooter tells Henry that he'll have to buy him a new football by Saturday. (Here, Aaron kept saying, "Scooter is not very nice.") Henry feels hopeless: he has no idea how he'll ever make so much money in just a few days' time. 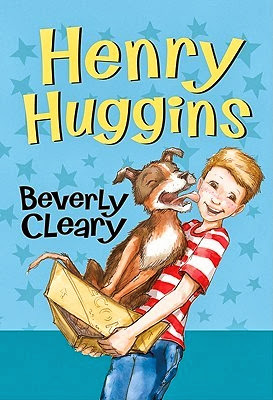 Here, I really liked the way Mr. and Mrs. Huggins supported and encouraged Henry. They never offered to bail him out, which I'm sure many parents today would do, especially after Henry had already put in a lot of time and effort to try to earn the money. Instead, they helped him catch the remaining two hundred and twenty-eight worms he needed. It was actually a great lesson to me: help your children fix their mistakes but never do the fixing for them. So Henry buys the new football and is just about to take it over to Scooter's house when the doorbell rings. Aaron, Maxwell, and I literally held our breaths as we, along with Henry, heard a man ask, "Excuse me, could you tell me who owns this football?" I read those words slowly, so the full meaning of them would have time to sink in. Our eyes were shining, and the boys were cheering and jumping up and down on the bed as the man explained that he had wanted to stop when the ball landed in his car, but he had to get his wife to the hospital. Even though I'm sure the future holds many wonderful reading moments together, I think it's going to be difficult to top that one. The build-up was perfect, and we were all so thrilled that Henry got to keep the football he'd worked so hard to earn the money for. I don't know if I've ever seen the boys more excited about an outcome than at that moment. Each chapter was like that one: a self-contained story with its own little climax and resolution. But there was also continuity between the chapters, which I loved, and also, an overarching story which began and ended with dear ol' Ribsy. I probably don't need to talk up a book that is 63 years old. Just the fact that it is still being published (with new covers and illustrations, which I'm actually not all that fond of, by the way) is testament enough. But I'll just add my voice to the thousands that have already spoken and say that for me, this was a near-perfect book. I know there are some excellent children's books that have been published this year. I, for one, am super excited about The Year of Billy Miller by Kevin Henkes, which I've already seen compared to Beverly Cleary in style and content. I just hope that in the midst of all those great new titles, we will continue to enjoy the truly excellent literature of the past. I loved Beverly Cleary as a kid. How fun that your boys enjoyed this so much! We are currently reading Henry Huggins. Christian loves it. Actually Blaine and Angela do too even though they’ve both read it in the past. Also we just finished ‘Henry and the Paper Route’ and loved that. By the way, did you know Beverly Cleary is still alive and is 97 years old? I'm glad you caught the vision of what a wonderful experience it was for us! I always loved "Henry Huggins" ("Ribsy" is wonderful, too), but the Ramona books were definitely my favorite. Beverly Cleary is one of my all-time favorite authors, and I can't wait to read her books to my kids. I am currently reading this to my 4 year old and he loves it so much! I'm also excited to read The Year of Billy Miller. I just checked it out from the library.